We’re putting up loose hay in the 1940s and 1950s on the Scheckel farm outside Seneca in the middle of Crawford County, Wisconsin. When Dad deemed the load was full, the hay loader was unhooked from the hay wagon, and off to the big barn we would go. The load of hay was backed into the barn and the task of unloading began. Most farmers who put up loose hay (not baled) had a mechanical hay carrier to lift the loose hay from the wagon and deliver it into the barn’s haymow. A trolley ran on a track that was fastened to the very apex of the inside of the building, just under the highest part of the roof. This track and trolley ran the length of the haymow. The trolley would be positioned over the hay load. A trip mechanism bolted on the track above the load, would release a double harpoon hayfork, and hayfork would be lowered by pulley and rope, onto the load of hay. The tines of the hayfork were about 30 inches long and spaced about 20 inches apart. Each tine had a little built in sliding bar to operate a “gripper” at the end of each tine. lever or finger that opened and closed. When this mechanism was set, the hay was kept in place and could be released by a trip rope. Dad would push the harpoon fork into the load of hay. Then he would pull up on the tine trip arm to set the grippers, one at a time. 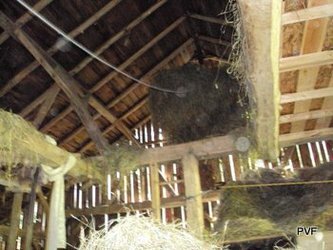 The hay rope was a one-inch diameter manila rope 150 feet long that ran along the track, through a series of heavy pulleys: one at the end of the barn, one on the cell near the corner of the barn, and one base of the barn anchored by a push. The rope was attached to a single tree pulled by one horse. Dolly was the chosen horse. She was gentle, slow but strong, and glistened black when she sweated. Dad would yell out “Ok, go”. We led Dolly by a rope attached to the halter. “Gippy up” Slack was taken up and Dolly would lean into the load. The rope tightened. The pulleys strained. Straight up went the harpoon fork with its load of hay. When the hayfork reached the trolley, a locking mechanism attached the pulley carrying the hayfork and the trolley was released from its center position and free to travel down the track. The fork load of hay would be delivered to bin 1, bin 2, or bin 3 in the haymow. Two or three of us mowed the hay. We would designate which bin to drop the hay. Dad held onto the quarter inch trip rope as it threaded through his hands, Dad would tug on the small trip rope and the load of hay fell into the correct bin with a swoosh and a breeze and hay dust. Dad would yell “Whoa”, the kid leading the horse would stop the forward movement of Dolly. Tension on the rope eased. The horse was turned around, with another kid pulled the rope back so it would be in place for the next load. Dad pulled the trolley back to the position above the load of hay, the hayfork would lower and Dad would stick into the load, set the lever, and the process was repeated until all the hay was unloaded. I’m guessing it took about 6 lifts to unload the entire wagon. When we were 6 or 7 years old, our job was to pull the rope back. When you reached ages 10 or 11, you could lead the horse. When 13 or 14, you were in the hay mow with a 3 tine pitch fork, throwing the hay to the side of the barn. That was the hardest job of all. It might be 70 or 80 degrees outside, but up in the hayloft, you could easily add another 20 degrees, and not exaggerate. This was hard, dirty, sweaty work.